I'm going to be honest here, saying that I don't remember Vinnie Vincent Invasion's "Love Kills" is an understatement for me. It was released back in 1988 on the A Nightmare on Elm Street 4: The Dream Master soundtrack and pooped up in an episode of MTV Classic's Metal Mayhem this morning. Vincent started the group back in 1984, after finding fame as a member of KISS. 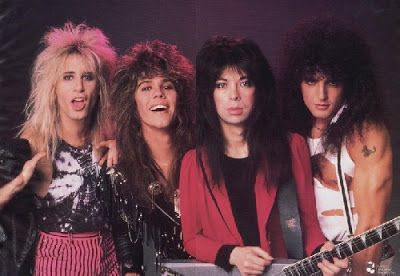 In 1986 he hired Mark Slaughter to handle the lead vocals and the group then had a few successful tracks. Anyway, I stumbled onto this video this morning and was struck by just how good 22-year-old Slaughter (looked) sounded here. He later went on to find success with his own band, Slaughter, into the 90's. In the years since "Love Kills" the group obviously disbanded but the guys have continued rocking out individually. Check out the video below, do you remember this one?